In the photo below we see Mr. Engel with his latest creation at that time. This photo is taken of one of the 55 cars built to his design by the Ghia company of Turin Italy. There was a big change at Chrysler Corporation in 1961 first, “Tex” Colbert was replaced with Lynn Townsend as President and Virgil Exner was outcast and Elwood P. Engel came from Ford to take over the V.P. of design for cars at Chrysler. 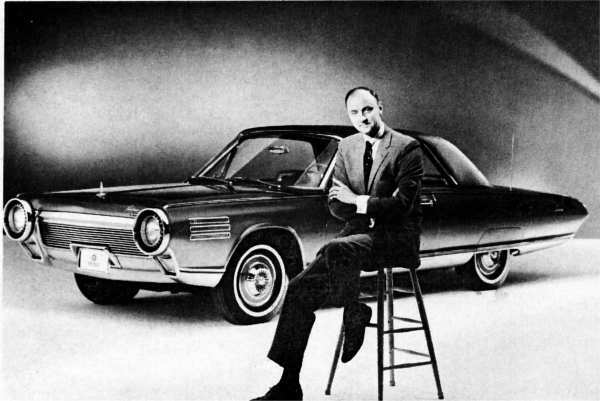 The 1962 and 1963 cars were started by Exner and modified by Engel – they were the biggest design flops in Chrysler’s styling history. 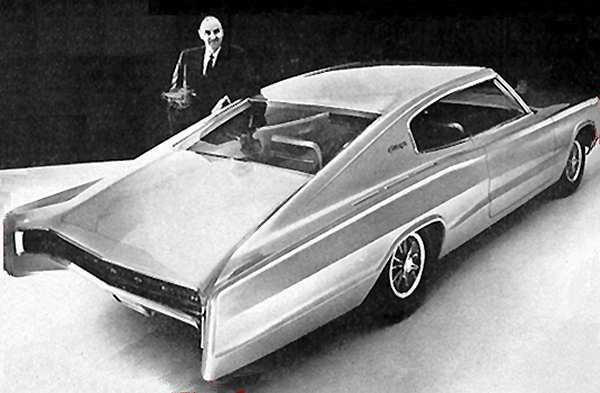 Some blame Engel for removing the fins from the Exner design but let’s face it – they were not very good looking cars – I speak as one who defended a 1962 Plymouth Fury (my first car) as being good looking and I knew it was ugly. While at Ford, Engel was responsible for the 1961 Lincoln and liked the “Chiseled” look with sharp creases. 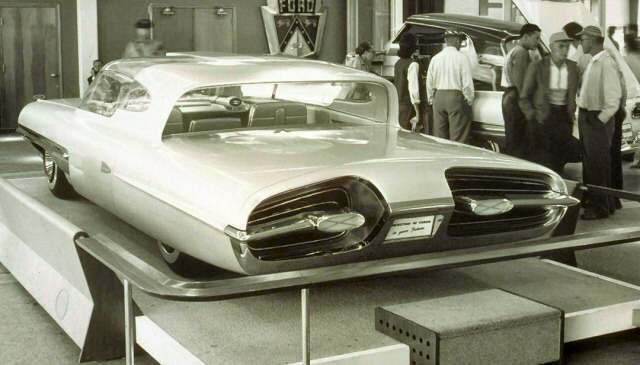 The fact that that look is not seen on the Turbine car suggests that there may have been other design considerations which made it look more like the Thunderbird. We see Engel had complete design authority when we get to the 1965 full sized cars that had a lot of creases and looked very “Chiseled”. He also designed the 1964 Imperial (separate company from Chrysler then) as one of the best looking "Imps" ever. This is a show car Mr. Engel designed while at Ford - the 1958 La Galaxie. I think we can say that he liked the design enough to carry it to Chrysler when he designed the Turbine Car. Here is Elwood Engel with his prototype for the 1966 Dodge Charger. It is kind of hard to believe that he designed the turbine car which did not have the slab, cut from stone look of his other cars. Click here or use the Back Button to return to main page.